EHA » EHA Hannover Fair Brief Day 4: Time’s up! EHA Hannover Fair Brief Day 4: Time's up! The Public Forum on the fourth day of Fuel cells and Hydrogen Europe Group Exhibit began to look like the speakers’ corner of “Hyde Park” but then without the jokes! The same mantra was repeated over and over again: technology is ready now andwe need “the policymakers” to support us in rolling out products and MW’s. EHA, on stage at the last day of industrial presentations at the Public Forum, analyzed this narrative. In EHA’s experience of almost 20 years walking the walk and backwards in Brussels, policymakers do not seem to be a kind of special breed or even robots yet. They are exceptional everyday human beings who for the most part can indeed do their math and indeed do their best to make something of this large FCH deployment. The problem is that nobody has ever “rolled out” large scale FCH applications, or managed an energy and transport transition let alone dealt ith mitigating climate change, This is exactly what younger generations Z and “H” have come to realize. nobody actually knows. Conventional solutions and innovation curves do not seem to match the urgencies of meeting the necessary targets any longer. Energy and Hydrogen Alliances of experts in technical, policy and managerial are needed to guide a Bermuda triangle of interests: hungry suppliers, impatient national and local policymakers and still quite conventional financing practices. After 25 years of annual gatherings of top notch European industrial potential in fuel cell and hydrogen technology at the Hannover Fair, time’s up for whining and dining decision makers…. In with no-nonsense, cheerful and energetic go-getters, who are aware of the technical potential understand the human factor and tweek policy to what it is meant for: dare to take the bold decision that make our societies and those to come a better place. 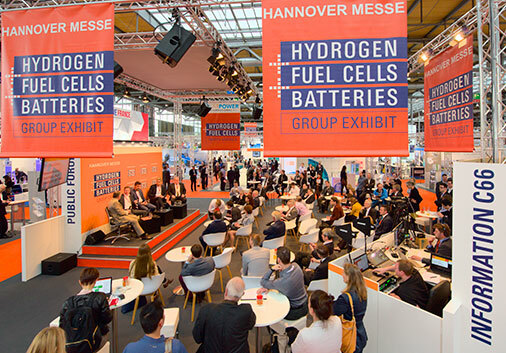 Congratulation team Fuel Cells and Hydrogen Europe Group Exhibit!